Muay Thai is the cultural Martial Art of Thailand. For the last 700+ years, Muay Thai has been refined into the modern olympic sport it is today. Considered very violent by many Western standards, Muay Thai uses the body as a weapon defining 8 forms of attack: legs, fists, knees, elbows. Powerful and effective combinations of knees and elbows and kicks and punches are the arsenal of each Muay Thai fighter. Muay Thai fighters are also very proficient at clinching and grappling with opponents in an attempt to throw their adversary to the ground. The history of the sport / Martial Art of Muay Thai is shrouded in a vale of mystery. Several hundred years ago, people and tribes originating from the steppes and mountain regions of southern China, migrated south towards the fertile lands in the cetral plateau of Thailand. Along this route of southerly migration, the tribes were met with resistance and attack by the tribes already occupying this region. The tribes fought each other for centuries until the “Tai” tribe had claimed dominance in the region from Chiang Mai south to Ayudhaya and Bangkok. The Kingdom of Siam was founded, but found itself at constant war with neighboring countries Cambodia, Burma, Laos, and Vietnam. 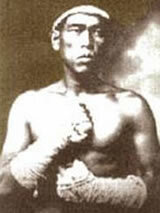 Much of the written history and archives of Muay Thai were lost during one of these wars with the Burmese. The capital city of Siam, Ayudhaya was razed and plundered in the 14th century. The Burmese stole countless artifacts, treasures, and destroyed much of what they did not take. Very few written texts, diagrams, drawings,and scrolls remain recounting the origins and development of the sport. 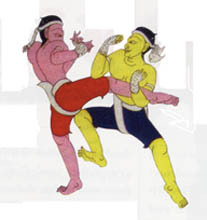 Despite the loss of valuable teaching manuals, Muay Thai remained in the heart of the Thai culture and thrived during the reign of King Naruesan. 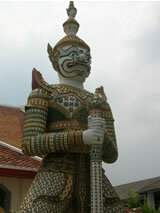 In the mid-1500’s, King Naruesan was captured in a battle against the Burmese. Offered a chance to fight for his freedom, The Thai King using his military training in Muay Thai, defeating each of the Burmese fighters he faced. Winning his freedom and his country’s respect and admiration, King Naruesan returned home a hero. His legendary tale of defeating the Burmese warriors and gaining his freedom helped create interest and practice of the sport among the Thai people. It was during this period that the Thai people claimed the sport as part of the national culture and unique to the Kingdom of Siam (Thailand). With the popularity of the sport growing, many soldiers returning home from the military engaged in contests of fight and sport in villages, festivals, and cities. The increased practice and involvement in the sport soon led to the first schools or gyms being built by soldiers and fighters who excelled at the art. The Monarchy helped promote the sport by putting on large festivals in the capital and provincial cities. The first Muay Thai fights were promoted with village and local champions squaring off to fight to entertain the Royal family and the many spectators. The love for Muay Thai has never waned with the Thai people through the centuries. One of the most popular Thai-legends is that of Nai KhanomTom. A revered Muay Thai fighter, Nai KhanomTom was captured and taken prisoner when the Burmese sacked Ayudhaya in 1787. Forced to march into Burma, Nai KhanomTom was housed with other Thai soldiers and prisoners awaiting the judgement of the Bumese King. The King decided to have a festival in celebration of the Burmese victory, and ordered Nai KhanonTom to “display” the “Thai-style” of fighting. Placed in an open courtyard in front of the King and his audience, Nai KhanomTom faced his first Burmese warrior. Nai KhanomTom went on to defeat each and every opponent the Burmese King placed before him. Using his knees, elbows, legs, and fists, the staple elements of modern and aincent Muay thai, Nai KhanomTom battered each opponent until they could not rise from the ground. Upon defeating the last of as many as 10 Burmese fighters, Lord Mangra, the Burmese King, showed respect and mercy and awarded Nai KhanomTom his freedom and gifted him two Burmese women to be his concubines. Nai KhanomTom returned to his home a hero. Today, he is recognized as the “father” of the sport and the greatest warrior of the Noble Martial Art of Muay Thai. After WWII, stadiums dedicated to Muay Thai were built in Bangkok, Chiang Mai, and Sukothai. Rules, comparable to American Boxing, were intergrated into the sport, as Muay Thai evolved from it’s roots into a legitimate sport/Martial Art with an international interest. Rules changes involving gloves, time of each round, protection, and point scoring were adopted to help the sport become main-streamed, and eventually, a better product for television broadcasts of fights. Foreigners, stationed together with Thai soldiers during WWII, spoke respectfully of the violent but graceful style of fighting called: Muay Thai. Not long after the war, foreigners began to travel to Thailand to experience the culture of Thailand and the strange and exotic Martial Art of the Kingdom. Today, Muay Thai is popular throughout the world. Most countries have governing organizations in Muay Thai, schools for instruction, and televised fights and tournaments that further the promotion of the sport. Muay Thai has been recently accepted as a Olympic sport, and has seen an increase in popularity among foreigners because of the similar tactics and strategies to Mixed Martial Arts a.k.a. Ultimate Fighting/Cage Fighting/Submission. MMA tournaments and organizations are popular on video and television in many countries. The popularity of MMA has helped broaden the international respect for Muay Thai which is considered an essential skill to learn for stand-up striking skills. Muay Thai is the most popular sport in Thailand today. Stadiums are present is most cities large and small. Television stations all carry Muay Thai fight programming several times per week. Large tournaments and World Championships are held every year in Bangkok and other populace cities. The Thai people are proud of their heritage and culture, and are happy that foreigners accross the world believe Muay Thai to be one of the most respected Martial Art fighting styles taught today.